Spray outs are a common incident in most of the industries. For the purpose of safety, spray shields & flange guards are installed on flanges, valves & joints. However there are some industries where immediate visual detection of spray outs is very important. 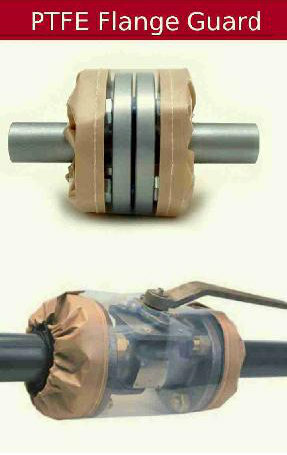 For such applications, Indana has a unique line of Transparent Flange Shield which allow for visual inspection of the joint. Clear Type PTFE Spray Shields are made from PTFE Fiber Glass Cloth with a clear transparent window in the centre. PTFE is highly resistant to the onslaught of acids, solvents & other corrosive service liquids. These Flange shields have been designed in accordance to the fluid dynamics. This empowers Indana Flange Guards to completely contain the spray out & completely diffuse the pressure of the splash thus providing a safe discharge. Clear Type PTFE Safety Spray Shields or See Through Flange Guards are available for Flanges (Flange Guards), Valves (Valve Spray Shields), Threaded Joints & Fitting (Safety Spray Shields). © Copyright 2017 INDANA STEEL PVT LTD . All Rights Reserved.